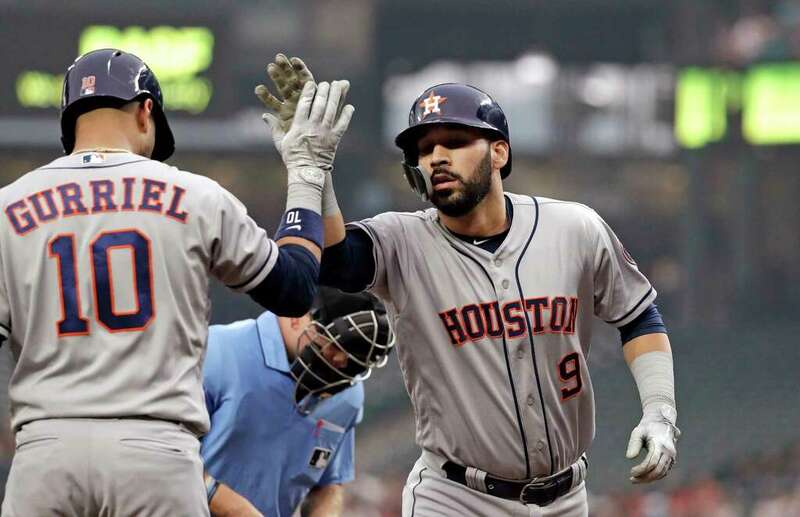 The former All-Star second baseman who sat out 80 games with a PED suspension and has only been back less than a week, drilled the deciding three-run homer in the eighth off Collin McHugh to spank the Astros, 7-4, and tighten the AL West race. Oakland, victorious over the Rangers, is back into a flat-foot tie for first while the Mariners have to feel blessed to be just 3-1/2 back even while their superstar has sat out three months. Seattle has now won the last five meetings against Houston. Seattle skipper Scott Servais didn't get to see the ending as he was ejected in the eighth while protecting Dee Gordon who was objecting to a strikeout. Servais jumped between Gordon and umpire Mike Muchlinski and uttered the prescribed verbiage to earn a quick hook. Rather than depress his team, the heave-ho seemed to ignite the rally that ended with Cano's opposite field bomb into the smoky gloom of the left field seats. It was Cano's first homer since May 12th. Marwin Gonzalez owned the early part of the game, bashing a solo homer in the first off Felix Hernandez then a two-run double in the third. Gonzalez added the fourth run on a wild pitch. Meanwhile, Seattle plated two in the first keyed by a throwing error from Carlos Correa. An RBI double by Mike Zunino in the fourth and an RBI single by Mitch Haniger in the sixth, both times scoring Ben Gamel, tied the game at 4-4. Gerrit Cole lasted just five innings, giving up seven hits, two walks and two earned runs while fanning seven. Tony Sipp put the tying run on but Ryan Pressly allowed the game-tying hit. Despite the semblance of an offense, Houston still managed just five hits, three of them by Gonzalez. Correa is now 3-for-32 since returning from the DL. George Springer sat out Monday's game with a sore left quad. Jose Altuve is being rushed back to the bigs from his rehab assignment to try to put some life back in the lineup. Manager A.J. Hinch says he'll make his return in Tuesday's 9:10 pm Central contest. Bookmark it. If the Astros win the division this could be where the season turned. Mike Leake (8-7), who won in Houston during the last homestand, will pitch for the Mariners. Hinch gave little clues as to who would start for the Astros, saying only it would be a righthander from the bullpen. That rules out Sipp, McHugh and Cionel Perez. Whomever it is can't be expected to last beyond three innings so it will be a parade of arms pitching for Houston.